• More than 120,000 species exist ranging in size from one-twentieth of an inch to well over three inches long. • Take on various shapes. In the larva or maggot stage, flies resemble greasy white worms. • Do not have teeth or a stinger, but rather thrust needle-like hooks into victims and inject a digestive juice that breaks down cell tissue. • Have life span of approximately 21 days (house flies). • Are attracted to a variety of warm, moist substances from animal feces to human food and garbage. • Spread at least 65 human pathogens including typhoid fever, diarrhea, tuberculosis, salmonellosis and cholera. • Breed in garbage cans, compost heaps, pet feeding and pet elimination areas. Below is a list of fly resources from around the web. 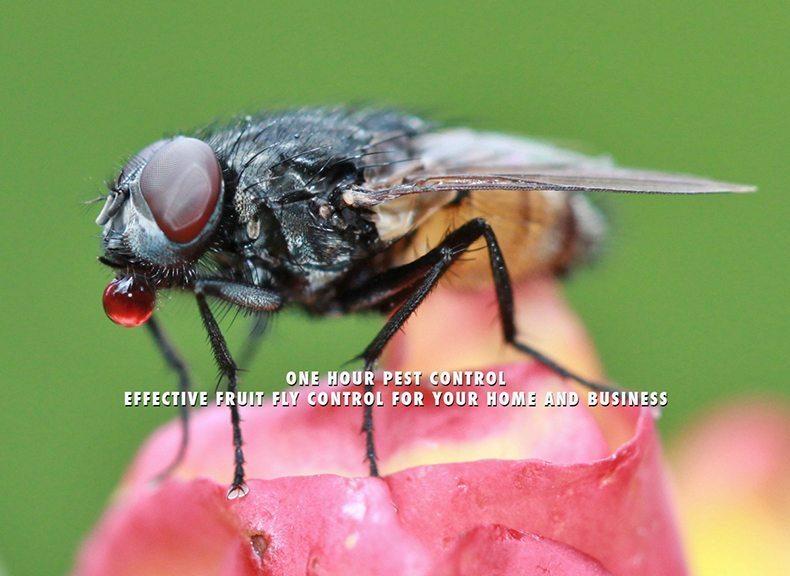 This is one of the most comprehensive assemblies of informational links we have seen and we bring this to you as part of One Hour Pest Control’s mission of being the Authoritative Source for Information. All web site links were verified as active and current as of March 16, 2016. Fruit flies are small pests that are commonly found in homes, restaurants and other facilities where food is processed. They are found on moist, decaying matter that has been stationary for several days. House flies tend to stay within 1-2 miles of where they were born; however, they have been known to migrate up to 20 miles to find food. Fruit flies are found in unsanitary conditions, so they are a potential health concern, especially when present in health facilities. These insects have been known to carry over 100 different kinds of disease-causing germs, which makes them very bad house guests.